The insulating block is a novel design of building block that utilises material properties more efficiently and effectively. It consists of two independent, identical precast concrete elements that gives the block shape and load bearing capacity. These elements are bound together with a superior thermal performance material acting as a binding agent. This innovative design creates three layers of insulation between four layers of concrete in a narrower block (200 mm) than the Maltese standard. The novel design increases the length of the insulation, thus further improving the transverse resistance to heat transfer. Consequently, it prevents heat loss by ensuring thermal bridging between the internal and external skins. It was physically tested and validated that its high thermal performance exceeds the current U-value requirements. Moreover, the integrated insulation material also serves as a noise attenuator. Whereas, additional features ensure the non-depleted load bearing capacity (7 N/mm2), the acoustic performance and space saving during manufacturing and building. 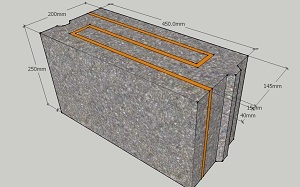 Thanks to its improved features, the insulating block has the capacity to replace the standard hollow concrete block. It achieves a significant leap in thermal insulation as an insulated core and offers the same load bearing capacity as standard market products, while having a slimmer shape, saving precious area in the building. Its recommended field of use involves radical ambient temperatures and the need for humidity control. Such extreme conditions arise in cold rooms and basements, respectively. However, the insulating block has the potential to become the preferred building material in any residential and commercial developments. The block has been prototyped and tested for physical parameters and U-value. An application for a registered design was submitted in Malta (no. 1462) by the University of Malta in May 2015. We are looking for potential licencees and collaborators to develop a final product for manufacture and sale.